Do You Work in the Ultimate Sports Office? Do you work in the Ultimate Sports Office? 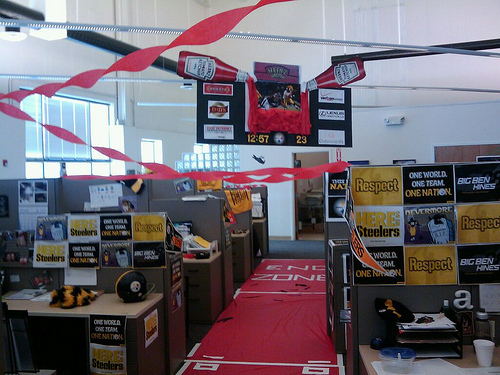 Are you looking for ways to renovate your office to demonstrate your fandom? If you would like to nominate your workspace as the "Ultimate Sports Office", please send an email with your name, email, and a jpg photo of your workspace to advertising@partnershipactivation.net by Saturday, February 7th . The Top 3 photos will be featured on PartnershipActivation.com! As the picture below demonstrates, Steelers fans are pretty serious about their football... How many people can say that they have a mock version of a scoreboard hanging in their office?